Led by the Ministry of Foreign Affairs, a number of stakeholders representing a cross-section of the Grenadian society, sat around the table on Thursday 27 November, to discuss the essential areas of focus which should be included in a country communication strategy to increase knowledge of the CSME in Grenada. The event, which took the form of a one day workshop, used participatory methods to discuss and agree on where knowledge gaps exist among youth, business people and public sector agencies charged to facilitate Grenadians as they seek to exercise their rights to move, work and do business in the Caribbean Single Market (CSM). Sitting around the table were representatives from the ministries and departments of Trade, Tourism Immigration, Customs, Labour; as well as from the Grenada Chamber of Industry and Commerce (GCIC), the Grenada Coalition of Service Industries (GCSI), the National Training Agency (NTA), the Grenada National Organisation of Women, and the CARICOM Youth Ambassador. Delivering opening remarks, Foreign Service Officer Ché Phillip, who heads the CARICOM & OECS Desk within the Ministry of Foreign Affairs, gave a background to the implementation of the CSME across Member States. Mr Phillip brought participants up to speed on the developments and programmes that have been ongoing to ensure that the CSME is steadily progressing towards full implementation. The workshop is an activity of a Canadian-funded consultancy to improve information flows concerning the CARICOM Single Market in Belize, Dominica, Grenada, Guyana, Jamaica and St Vincent and the Grenadines.. Participants’ contributions will inform the development of the national strategy and awareness campaign plan, the implementation of which will be led by the Ministry of Foreign Affairs and supported by other state, business and community level stakeholder agencies. According to Barbara Jacobs-Small who facilitated the activity, the overall Information Flows improvement project comes from the recognition that more information means more awareness, and more awareness means more interaction between Grenadians and the Registry of Companies, border agencies, accreditation agencies and other relevant bodies. This, she said, would be indicative of a shift in the perspective that Grenadians have of themselves, namely as a Grenadian, but also a CARICOM nationals with certain rights and privileges. Jacobs-Small indicated that the Information Flows consultancy will be implementing recommendations outlined in a number of pre-existing Grenada country assessment reports which cite the need for communications structures and products for improving information channels and flows on the CSME in Grenada. Following on the heels of last Thursday’s workshop, are a number of technical worksite meetings which will give the opportunity to a number of stakeholders and officers of public agencies, Chamber of Commerce, The Grenada Industrial Development Agency (GIDC), GCIC and GCSI to update their knowledge on the processes and procedures involved in facilitating the public relative to the CSM Regimes namely Free movement of skills, goods, services, capital and right of establishment. 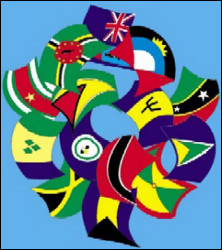 The CSME worksite meetings will take place from 1–4 December.